An elegant combination of form and function, the HP xw4300 brings you groundbreaking technology in an award winning tool-less package. 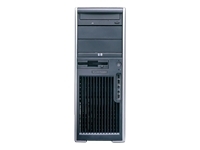 Offering great flexibility, with single or dual core processor and a range of graphics, memory and storage choices, the HP xw4300 meets the computing demands of engineers, designers, scientists, and power users. ISV collaboration and application certification coupled with the future proofing of 64-bit computing helps ensure a reliable, compatible, high performing workstation that can evolve with you and your business demands.